Kalamazoo, MI: On October 23, 2016 a concerned resident from the 2300 block of Hazel Ave contacted Kalamazoo Public Safety about an injured animal on his property. 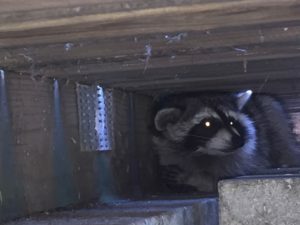 The injured animal, a raccoon, was under the resident’s deck. The raccoon had been shot with a carbon fiber arrow, commonly used for hunting. The arrow was shot through the base of the raccoon’s right ear. The raccoon also became entangled with rope when it went under the deck. 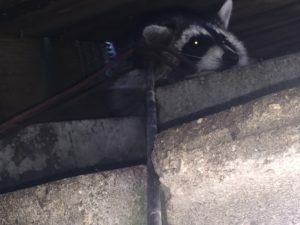 Public Safety officers were able to safely untangle the rope from the raccoon and remove the arrow from the raccoon’s ear. This incident remains under investigation. Kalamazoo Public Safety would like to remind everyone that ‘no person shall hunt or trap wildlife at any time within the City limits’ (ord 7-9). Humane trapping and releasing is allowed for some nuisance animals and animals causing damage to property. Please see city of Kalamazoo ordinance 7-9 for specifics. Anyone who may have information regarding this investigation or other crimes in Kalamazoo is asked to call Kalamazoo Public Safety at 337-8994 or Silent Observer at 343-2100 or www.kalamazoosilentobserver.com.